The Red Centre has its own type of Winter Wonderland. There is no beautiful white snow but there are glorious clear blue skies and lovely warm afternoons. From June through to around now, the nights are cool, but the days are incredible, sometimes cloudless for weeks in a row. The birds have been out in force in recent months. 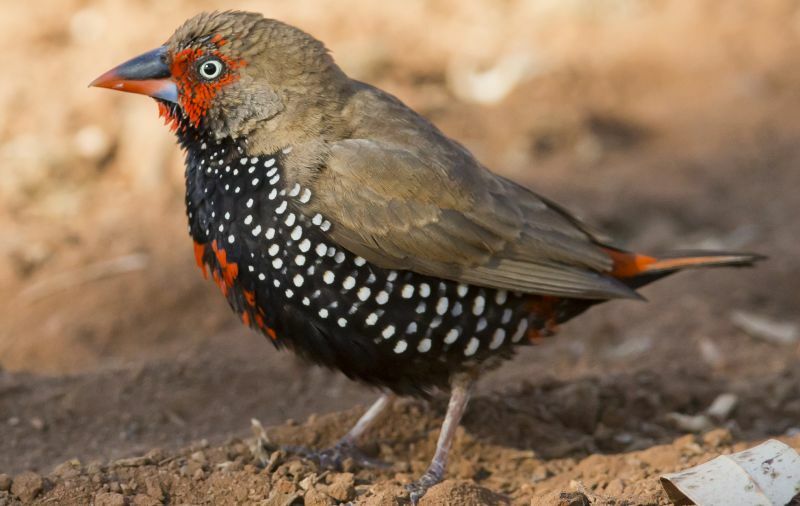 When walking into the gorges, valleys and waterholes there is a chorus of honeyeaters, and if you are lucky you will hear the call of the Grey Shrike Thrush or see the Painted Finch (Firetail). Out in the open are Black-breasted Buzzards and Whistling Kites soaring around looking for mice and small marsupials to swoop down on amongst the spinifex grass. Between the stands of Mulga trees you can see Black-shouldered Kites hovering while they stalk their prey underneath, keeping their heads perfectly still while their wings flutter rapidly before they dive on their prey. This type of weather allows control burns to take place, aiding the hunting fauna in finding their next meal. At first burning the land can seem destructive, but it is crucial to effective land management. Anangu people, as well as indigenous people from all over Australia, used fire to manage the land and keep everything strong and healthy. Some plants, such as Acacia’s and Grevilleas, have evolved to rely on fire, in order to break seed dormancy and allow germination. One of the major reasons small, low intensity fires have been used for thousands of years is to control the undergrowth and reduce the fuel load that could intensify a bush fire. Large bush fires caused by lightning and unfortunately also by humans, can devastate the areas they engulf, as temperatures are high and they move quickly. The high temperatures incinerate not only the vegetation, but the seeds waiting to germinate in the soil. Furthermore, when a fire moves quickly it inhibits wildlife from escaping to a safe patch of land and surviving. Not only do small controlled fires reduce the chances of bush fires later in the year, but it allows new growth to thrive so plants can grow fresh seeds and fruits. Animals need to eat the seeds and fruits, and in the past indigenous people relied on them as well. An old tree or clump of grass is less productive, but a fresh plant will yield a healthy crop for collection. For the duration as well as after the fires when there is fresh growth re-sprouting, animals such as kangaroos or wallabies are drawn back to a burnt area to feed on the sweet new shoots. The above mentioned birds of prey can also be seen circling and hovering over the charred landscape, stalking the fauna on the ground as they are fleeing the fire or returning to feast on the new seasons growth. When it comes to sunset you can watch the impossibly blue sky fade above the orange and red hues of the surrounding landscape. As the colours fade, so too do the sounds of nature, until the starlit sky envelopes you from horizon to horizon. Please click here for more information about creating your very own Red Centre adventure.